GREATER Western Sydney has signed former world youth octathlon champion Jake Stein as a category B rookie. Stein, 22, was crowned the youth world champion in the octathlon in 2011 before taking home the silver medal in the decathlon as a junior competitor the following year. The Penrith product represented Australia at the 2014 Commonwealth Games. He false started twice in the 100m sprint and was disqualified but completed the rest of the event and finished 14th. 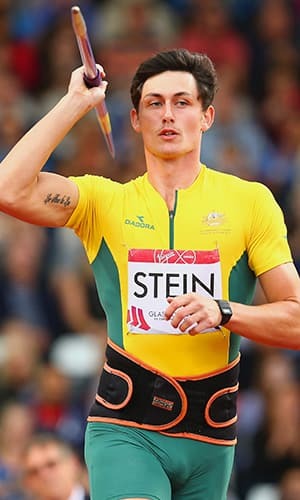 Having been an athlete for his whole life, Stein considers his running and jumping as strengths. He spent 15 years playing soccer in defence and sees himself bringing those skills to the AFL. "With the coaches, we're talking about playing as a defender here. I'll be able to read the play pretty well from back there," Stein told gwsgiants.com.au. "I've always been able to jump high from athletics, jump far and run pretty quickly so I think that will translate to the footy field." At 192cm, Stein looms as a versatile player capable of playing on opponents of different sizes. His association with the Giants started when he began running with then-fitness staffer John Quinn in 2011. After finishing his athletics season midway through this year, Stein met former GWS assistant coach Luke Power to explore the option of playing football. He met more of the Giants team and despite admitting to "spraying a few" kicks in front of senior coach Leon Cameron, the club recruited Stein. Having had limited experience with Australian football, Stein knows he needs to develop in the reserves before he makes the senior team. "I'll start off in the NEAFL and keep working hard and with all the development coaches," he said. "Eventually, hopefully I'll get into the senior team. It won't be easy obviously, with the depth that there is in the list." Giants football manager Wayne Campbell told the club website Stein would begin training next week. "Jake's a very gifted athlete and an impressive person and we're delighted he's joined the Giants," Campbell said. "He’s got a strong sporting background and he's impressed in a number of trials he's done with our staff over the course of this year. "Jake will work closely with our development coaches to get up to speed as quickly as possible and we look forward to seeing him commence training with our younger players next week." Greater Western Sydney signed rugby league star Israel Folau in 2010. He played 13 games for the Giants before quitting for rugby union in 2012.